What’s this I hear about some fantastic bowl thing happening this weekend? I don’t know much about it, but I guess it’s supposed to be super? Some sort of super cup, or maybe it’s a bowl, during which people yell loudly and drink beer and dunk chips and chomp various meat products? Or something? Well. I think it sounds fun. I mean I’m not really one to watch gigantic humans battling U.S patriots for the skin of pigs, but if this whole thing is really supposed to be so super and inclusive of bowls of meat, then I think I’d like to participate. I will make meatballs. No, I kid. I like, totally know everything about football. Zone defense. Extra points. First and ten. See? Totally. And as it turns out, I’m not really a fan of either Tom Brady (cleft-chinned cad) or Eli Manning (sad-faced man-boy). Still, I think I’ll take Peyton’s man-boy brother to beat the spread over weirdly cartoonish Brady. Does anyone else think he looks like Gaston from Beauty and the Beast, just with tighter pants and less cool shoes? I mean, I’ll leave that stuff to the experts. The point spread and the tight pants. I’ll stick with the meatballs. These guys are light and flavorful; you won’t miss the beef. Serve in a deep bowl with some extra basil and ricotta, or wedged between an Italian loaf with some provolone cheese for a hearty game day sandwich. In a large pot or dutch oven, set the tomato sauce to warm over low heat, stirring occasionally to prevent scorching. In a very large bowl, combine the ground turkey, onion, parmesan cheese, breadcrumbs, herbs de provence, salt, pepper, mustard, olive oil and finely chopped basil. Use your clean hands to gently meld together all ingredients, but do your best not to squish and squeeze everything too vigorously (overworked meat leads to dry, tough meatballs). Once all ingredients are combined, scoop up the meat mixture and roll gently into golf-ball sized meatballs (you should get around 60 meatballs). Don’t pack the meat too tightly – the meatballs should hold their shape without falling apart, but they shouldn’t be entirely firm and dense. Place the formed meatballs on a sheet pan until ready to cook. 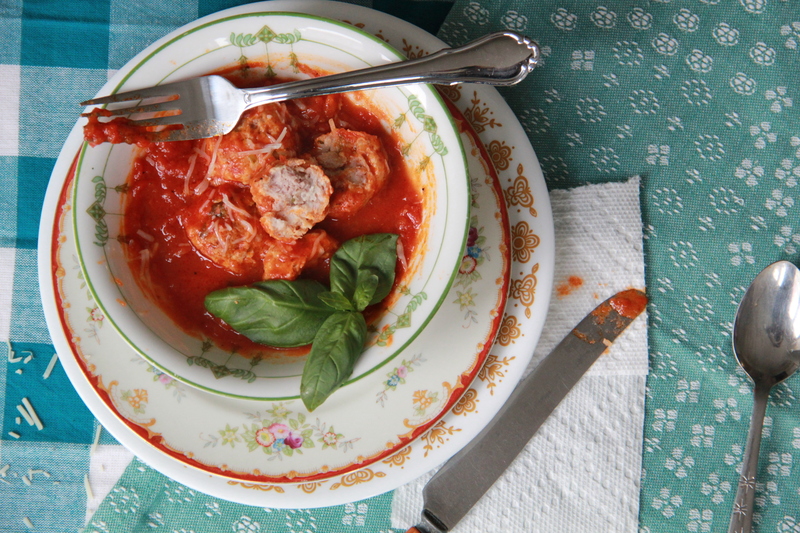 Gently drop the meatballs into the warming sauce (you may not be able to fit all of them into one pot – if that’s the case, divide the sauce and meatballs between two large pots), and bring to a gentle simmer. Cover and cook until meatballs are entirely cooked through, about 40 minutes. 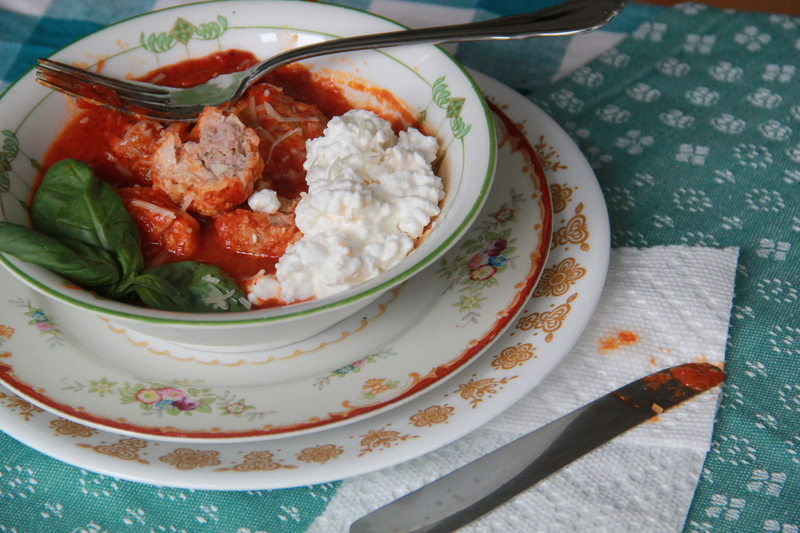 Serve hot with extra basil leaves and generous scoops of fresh ricotta. This is an interesting way to serve them. I like it. Thanks! 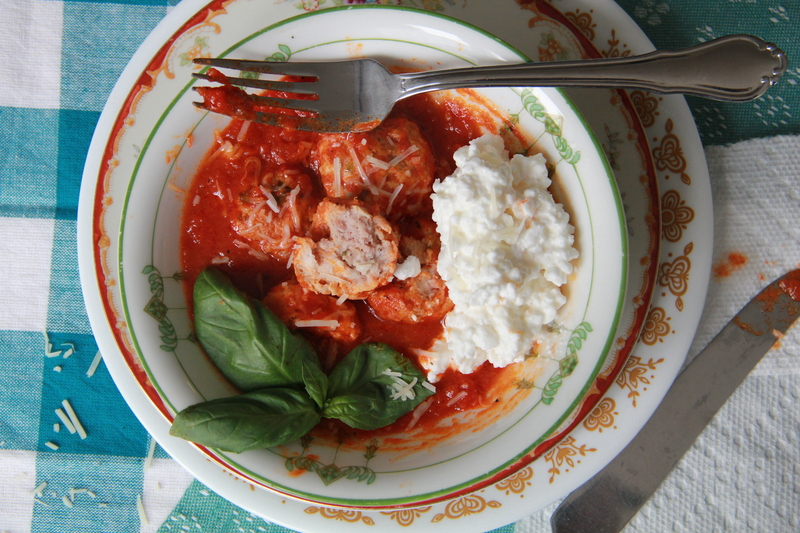 I like to serve ricotta with pretty much everything — it goes particularly well with these meatballs. Peter, you should make these for Laura. Just saying. Pretty funny stuff. Oh, and the meatballs look darn good. thanks AFG. same initials as my mom, incidentally. quite a coincidence. We’re having a Super Bowl party here at BRG World Headquarters. Is there any chance that you can get someone on your staff to make some of these meatballs for our group? Thank you! Molly! These were a HUGE hit at my superbowl party! Thanks for the suggestion!! made these again last night and served over linguini – fabulous!!!!! The turkey meatballs crushed it on sandos for Superbowl 2013! Thanks, Molls.